Police in Peru stormed an ancient Inca temple to release a group of foreign tourists taken hostage by coca growers. The farmers were reportedly protesting against government efforts to eradicate coca, which is used to make cocaine. 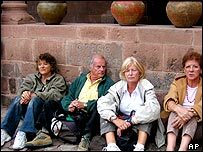 Tear gas was used to free the 19 tourists, most of them French, who had been held for over an hour inside the Koricancha temple in the city of Cuzco. Seizing foreigners marks a change of tactic by the coca growers, the BBC's Hannah Hennesy in Lima reports. It is the first time tourists have been held in an effort to attract the government's attention, she says. The group was surrounded by around 70 unarmed coca farmers and students as they were touring the Koricancha temple, a popular attraction in Cuzco, one-time capital of the Inca empire. Many tourists heading for Peru's largest tourist attraction - the Machu Picchu citadel - often stop at Cuzco, correspondents say. No one was injured in the police raid but one woman was treated for inhaling tear gas, firefighters said. A police spokesman said seven "militant coca growers" had been detained and the rest had escaped. Peru is the world's second largest producer of cocaine and its government is implementing a US-funded programme to eradicate the coca crop. However, coca growers say their livelihood depends on the plant they hold to be a vital part of indigenous Andean culture. They have been demanding talks with the government over its policy towards the crop. A spokesman for the growers told Spanish news agency Efe the government had failed to honour its annual promise to purchase a quota of the coca crop for legitimate use. The government denies it has broken any promises.